Journées Instrumentation du GDR Nucléon 8-9 Avril 2008, CEA Saclay Polarized Positrons at the Jefferson Laboratory (i) Physics motivations (ii) Principe. 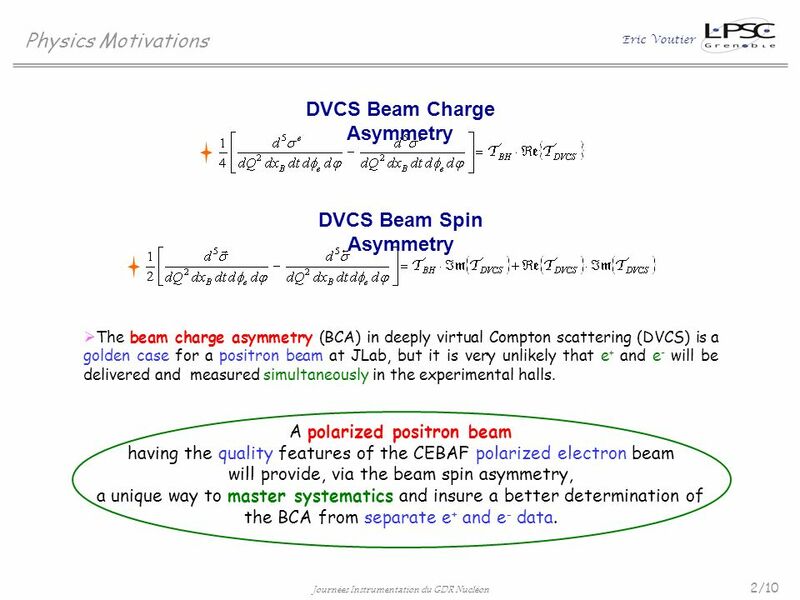 2 2/10 Journées Instrumentation du GDR Nucléon Eric Voutier Physics Motivations DVCS Beam Charge Asymmetry DVCS Beam Spin Asymmetry The beam charge asymmetry (BCA) in deeply virtual Compton scattering (DVCS) is a golden case for a positron beam at JLab, but it is very unlikely that e + and e - will be delivered and measured simultaneously in the experimental halls. A polarized positron beam having the quality features of the CEBAF polarized electron beam will provide, via the beam spin asymmetry, a unique way to master systematics and insure a better determination of the BCA from separate e + and e - data. 4 4/10 Journées Instrumentation du GDR Nucléon Eric Voutier Principe of Operation W.H. 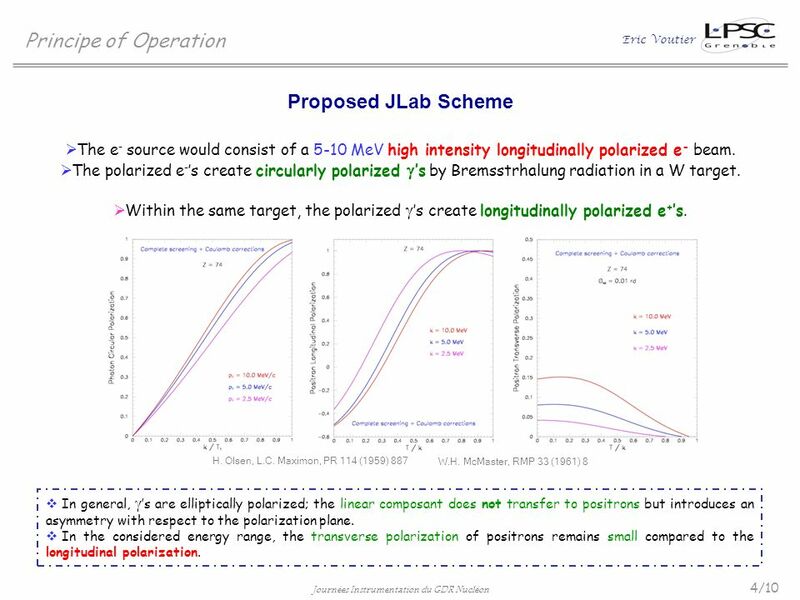 McMaster, RMP 33 (1961) 8 Proposed JLab Scheme The e - source would consist of a 5-10 MeV high intensity longitudinally polarized e - beam. The polarized e - s create circularly polarized s by Bremsstrhalung radiation in a W target. Within the same target, the polarized s create longitudinally polarized e + s. H. Olsen, L.C. Maximon, PR 114 (1959) 887 In general, s are elliptically polarized; the linear composant does not transfer to positrons but introduces an asymmetry with respect to the polarization plane. In the considered energy range, the transverse polarization of positrons remains small compared to the longitudinal polarization. 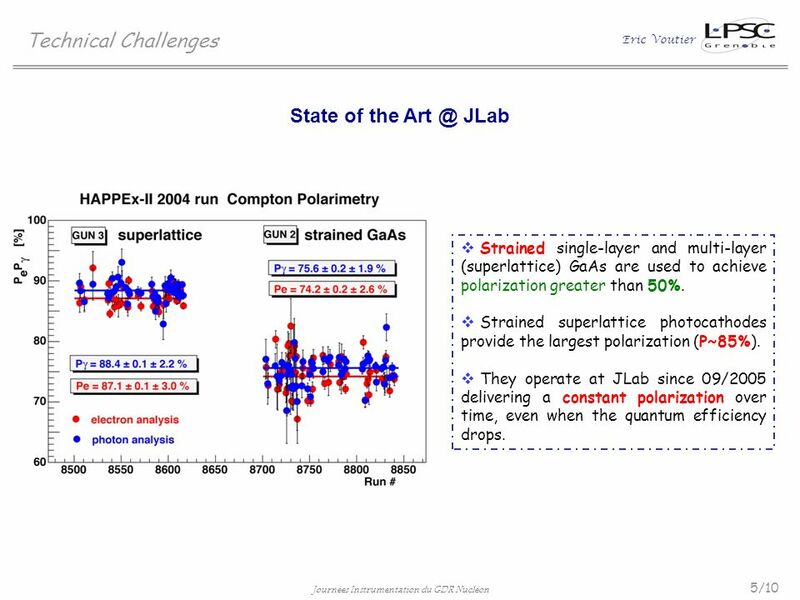 5 5/10 Journées Instrumentation du GDR Nucléon Eric Voutier Technical Challenges State of the Art @ JLab Strained single-layer and multi-layer (superlattice) GaAs are used to achieve polarization greater than 50%. Strained superlattice photocathodes provide the largest polarization (P~85%). They operate at JLab since 09/2005 delivering a constant polarization over time, even when the quantum efficiency drops. 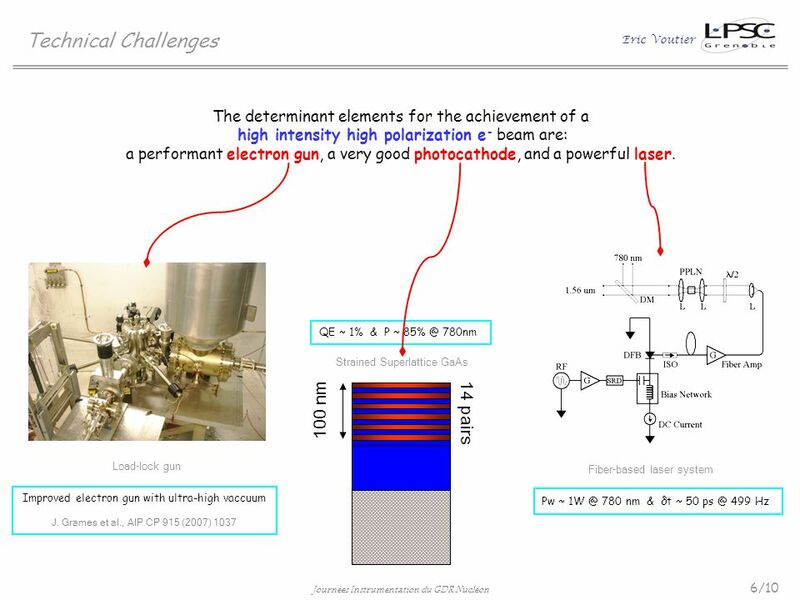 7 7/10 Journées Instrumentation du GDR Nucléon Eric Voutier Technical Challenges RF Fiber Laser 100kV Load Lock Polarized e - Photogun Load & Prepare Superlattice Photocathode 1 mA e - beam J. Grames et al., Proc. 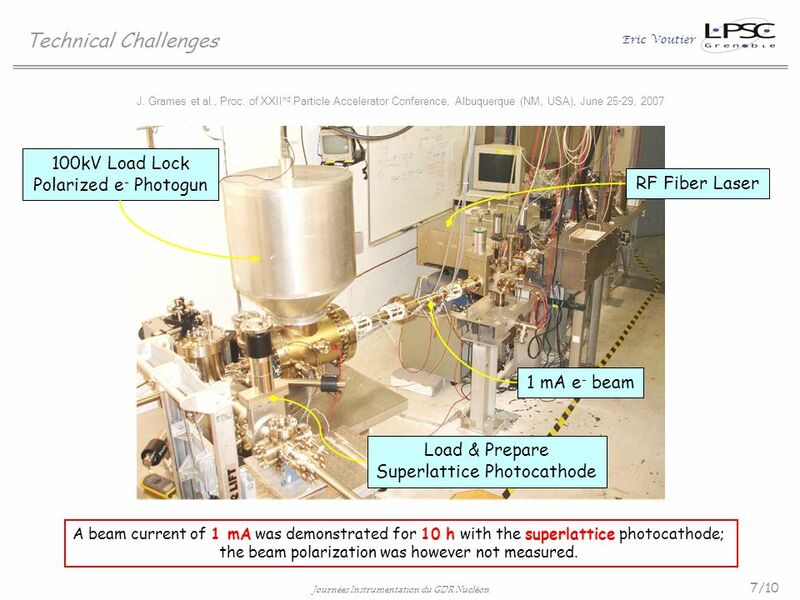 of XXII nd Particle Accelerator Conference, Albuquerque (NM, USA), June 25-29, 2007 A beam current of 1 mA was demonstrated for 10 h with the superlattice photocathode; the beam polarization was however not measured. 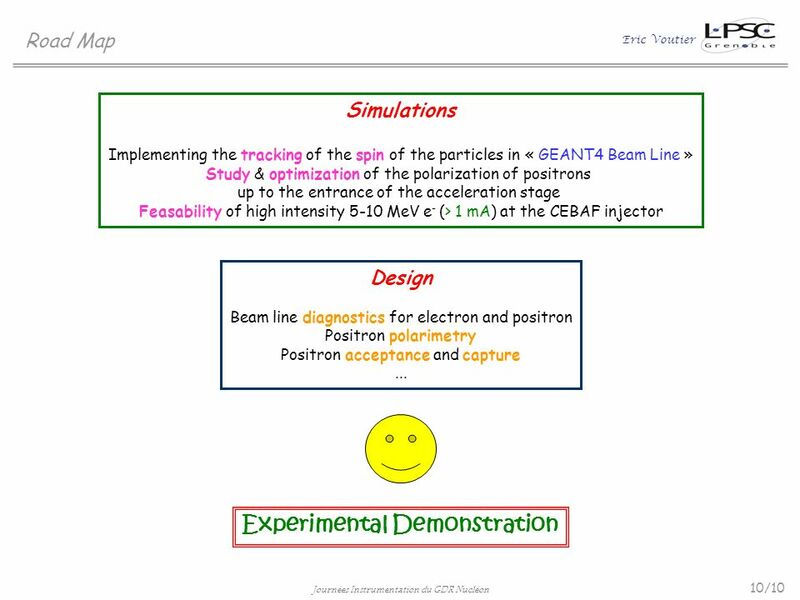 8 8/10 Journées Instrumentation du GDR Nucléon Eric Voutier GEANT4 Simulations GEANT4 simulations are performed for a 10 MeV/c longitudinally polarized (100%) e - beam in perpendicular incidence on a 1.2 mm thick tungsten foil. 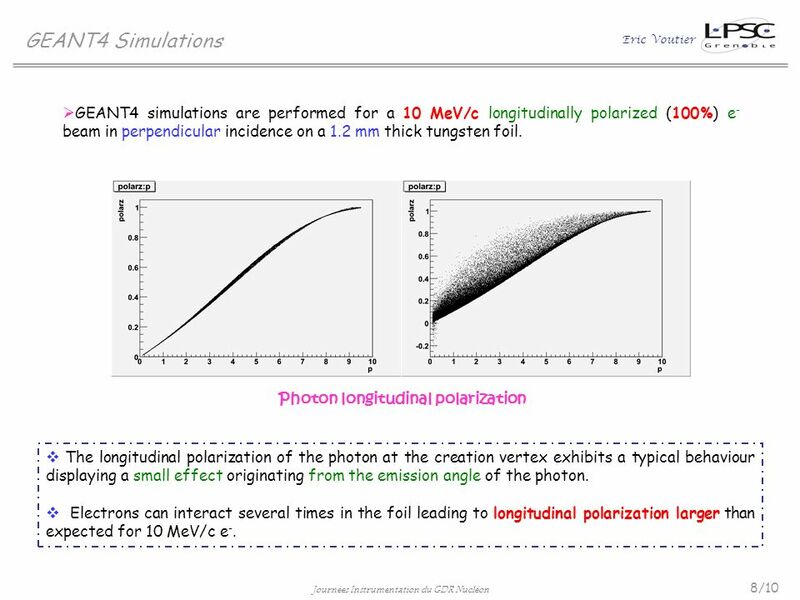 Photon longitudinal polarization The longitudinal polarization of the photon at the creation vertex exhibits a typical behaviour displaying a small effect originating from the emission angle of the photon. Electrons can interact several times in the foil leading to longitudinal polarization larger than expected for 10 MeV/c e -. 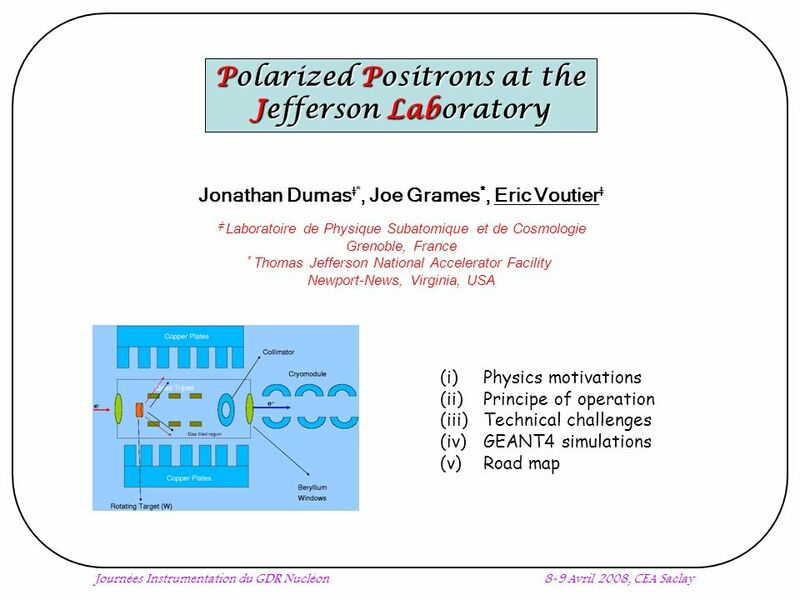 Download ppt "Journées Instrumentation du GDR Nucléon 8-9 Avril 2008, CEA Saclay Polarized Positrons at the Jefferson Laboratory (i) Physics motivations (ii) Principe." Thomas Jefferson National Accelerator Facility Operated by the Southeastern Universities Research Association for the U.S. Dept. Of Energy 1 Spin Dance. 5 MeV Mott Measurement for CEBAF Operations group Joe Grames, Marcy Stutzman February 14 th, 2007 Sir Nevill F. Mott at the ceremony with his Nobel Prize. Compton polarimetry for EIC Jefferson Lab Compton Polarimeters. 1 Electron Beam Polarimetry for EIC/eRHIC W. Lorenzon (Michigan) Introduction Polarimetry at HERA Lessons learned from HERA Polarimetry at EIC. 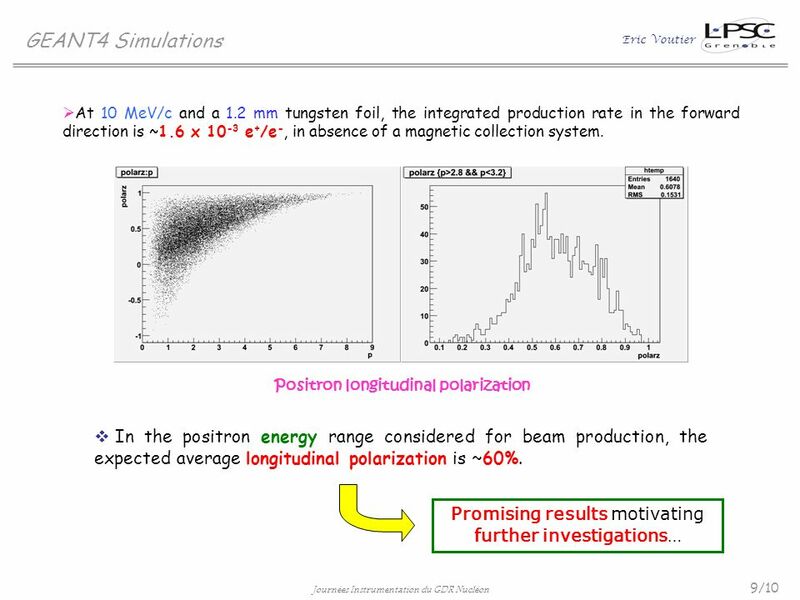 Undulator-Based Positron Production in the Final Focus Test Beam (E-166) The International Polarized Positron Production Collaboration K.T. McDonald, J.C.
JCS e + /e - Source Development and E166 J. C. Sheppard, SLAC June 15, 2005. 5 th Rencontres du Vietnam - Aug. 7, 2004 Polarized Positrons…E166 A.W.Weidemann 1 Introduction (What, who) Motivation (Why) Experiment and Polarimetry. 05/20/ High-Current Polarized Source Developments Evgeni Tsentalovich MIT. Commissioning of a Nebraska-type Retarding Potential Mott Polarimeter J. McCarter, M. L. Stutzman, T. J. Gay, K. Trantham, P. Adderley, J. Brittian, J.
NLC - The Next Linear Collider Project Sheppard/Pitthan June 26, 2015 Towards an Undulator Based NLC Positron Source Towards an Undulator Based NLC Positron. Undulator-Based Production of Polarized Positrons An experiment in the 50 GeV Beam in the SLAC FFTB E-166 Undulator-Based Production of Polarized Positrons. 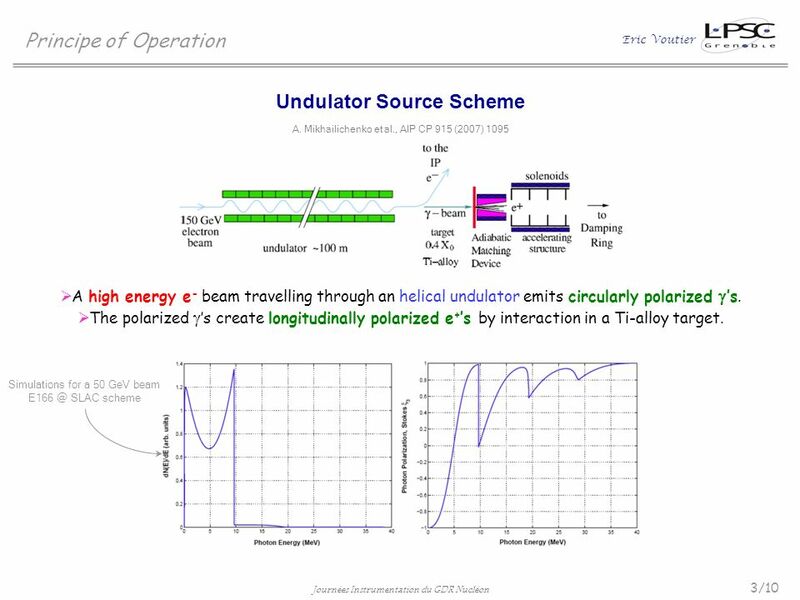 Undulator-Based Positron Production in the Final Focus Test Beam (E-166) K.T. McDonald, J.C. Sheppard, Co-Spokespersons SLAC Experimental Program Advisory. Why Studying n-DVCS ? Eric Voutier n-DVCS gives access to the least known and constrained GPD, E 0 because F 1 (t) is small 0 because of cancelation of. Conventional Source for ILC (300Hz Linac scheme and the cost) Junji Urakawa, KEK LCWS2012 Contents : 0. Short review of 300Hz conventional positron source. Gamma Beam Systems a simple introduction. Purpose of the machine Deliver a high performance photon beam: Variable energy Highly polarized High intensity.